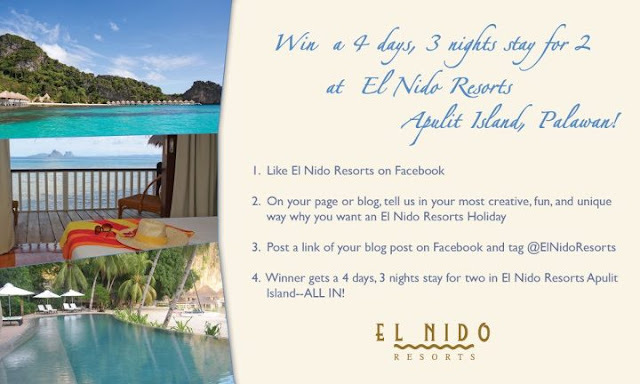 > Win a 3N/4D Stay at El Nido Resorts Apulit Island! Win a 3N/4D Stay at El Nido Resorts Apulit Island! Do you want to experience staying in luxurious El Nido Resort in Apulit Island? If you do, then this is your chance to Win a 3N/4D Stay at El Nido Resorts Apulit Island! Who could join El Nido Resorts Bloggers Contest? If you are a blogger and you are dreaming of visiting this highly rated island property in Taytay Palawan, then this is your chance! Winner gets a 4 days, 3 nights stay for two in El Nido Resorts Apulit Island — All-in! Woooooooooot! This is amazing! Join now fellow bloggers and share this good news to your readers! Deadline for submission of entries is on July 15, 2012.